Bestseller Authored By Theresa Barnabei! So much has changed in real estate: When the housing bubble burst, consumers learned they had to adapt to current realities to survive. Now they’re more cynical, less trusting, and more demanding. The buying public is also much savvier about their options and the industry, thanks to the internet. Information is now massively distributed to anyone wanting to self-educate on buying or selling a home. Houses for sale, once controlled by real estate agents, are marketed via the Zillow’s and Trulia’s of the new world of real estate. What has not changed is the need for real estate professionals to earn consumer trust and loyalty by demonstrating why they deserve such confidence. 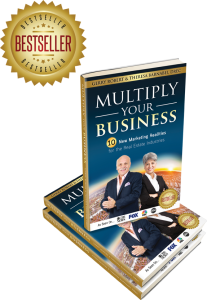 In Multiply Your Business, Theresa walks the reader through the issues, as well as basic tested and proven solutions that will create the perfect environment for long lasting business relationships that address the consumers’ economic needs of today!